Regular maintenance of your heater or furnace is crucial to prevent breakdowns, high energy bills, and even dangerous carbon monoxide leaks. It is recommended that the homeowner clean the filters, the furnace ducts, and the blower three or four times a year. However, your heating system requires a yearly checkup from a NATE certified professional. Making sure that your heater or furnace is operating at full capacity makes it possible for you to continue to be comfortable in your home, all while saving you money on your energy bill. Even more importantly, poorly maintained heating or furnace is likely to begin leaking carbon monoxide. Carbon monoxide is an odorless gas that can cause flu-like systems, disorientation, and even death. Carbon monoxide is capable of leaking through cracks that are invisible to the naked eye. This is the most important reason why your furnace needs to be inspected once a year by a professional. A yearly checkup from a professionally trained HVAC technician also ensures that your machine is running cleanly and efficiently. A service technician will clean the heating system, check all of the controls for safety, inspect the thermostat, check the electronic connections and balance the voltage between the system’s components, and make sure that all moving parts are lubricated. 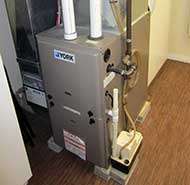 Keeping your heater or furnace in top shape puts less strain on the system. When there is less strain on the system, your heating system does not have to work as hard to keep your home warm. A well-maintained heater also reduces wear and tear on the system components and decreases the chance that they will break. HVAC experts say that 75% of the calls they receive related to a broken heater are a result of poor maintenance. Be sure to schedule a routine checkup for your heater or furnace BEFORE Winter! You don’t want to pay for expensive repairs while you are stuck in the cold. Mark your calendars and be sure to call the experts at Home Comfort USA. If all the people of Southern California are our family, then our dogs are certainly our best friends. That’s why we have partnered with the Westside German Shepherd Rescue. The Westside German Shepherd Rescue is a non profit 501(c)3 no-kill rescue that relocates all types of german shepherds from high kill shelters to loving homes. The rescue was founded in 2002 in the back of a veterinarian hospital. In those days, there was just a handful of volunteers and only 7 dogs. Over the course of fifteen years, the Westside German Shepherd Rescue grew to be one of the largest rescues in the Los Angeles Area. Since 2012, the Westside German Shepherd rescue has saved over 12,000 dogs! The amazing volunteers who help run the rescue are true animal-lovers that believe a little extra love and care will help them be the happiest dogs that they can be in their new homes. All volunteers have developed strong, personal relationships with the dogs. This one-on-one relationship allows volunteers to find a new home that is perfect for any dog’s one-of-a-kind personality. As a non-profit organization, the Westside German Shepherd Rescue depends on the help of the community. That’s why we at Home Comfort USA decided to offer our expertise to provide a unique service. If you have ever been to an animal rescue, you are sure to have noticed how hot and stuffy it can be inside the building. A lack of ventilation and air flow causes the air to “sit”. This allows bacteria, allergens, and dirt to settle into the carpets, furniture, and walls. This is not only uncomfortable but also detrimental to the health of the dogs. In 2016, Home Comfort USA equipped the Westside German Shepherd Rescue with one of our top of the line air conditioning systems. And just like the volunteers at the Westside German Shepherd Rescue, Home Comfort USA would not be satisfied until our animal friends had the absolutely highest quality of living. To maximize the efficiency of Westside German Rescue’s new air conditioning system, we took the additional step to provide them with a high quality air scrubber. An air scrubber is a type of filtration system capable of removing particles, gasses, and even odors from the air. In the past year alone, the hundreds of dogs living in the rescue have experienced less sinus problems, allergies, and illness. Both dogs and humans alike have also appreciated the relief from the hot Southern California sun during the summertime! The community at the Westside German Shepherd Rescue is strong, dedicated, and giving. Naturally, Home Comfort USA wanted to be a part of it. We both share a love of these athletic, charming, and intelligent German Shepherds and want the loving families of Southern California to enjoy them as well. We are proud of our work in increasing air quality to provide a cleaner, safer, and happier environment for these beautiful animals. To learn more about the Westside German Shepherd Rescue, visit: sheprescue.com. To find out how you can volunteer, contact: wgsr.volunteer@gmail.com. If you’re ready to add a new member to your family, apply for adoption here: http://www.sheprescue.org/Application_to_Adopt_a_Dog.html. 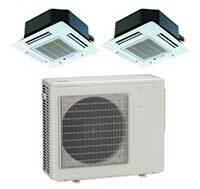 Home Comfort USA offers only the latest and greatest in energy-efficient air conditioning systems. However, there are certain steps that you can take to make your home’s A/C even more efficient. One way that you can make significant reductions to your home’s heating and cooling bill is with high quality attic insulation. You may be thinking that your roof is doing an adequate job of blocking the sun’s heat from your home. In fact, the complete opposite is true. Your roof actually increases the temperature within your home. When your roof is exposed to the sun, it “bakes” much like a hot sidewalk and eventually transfers to the rest of your house. Ultimately, quality attic insulation keeps your home cool, keeps you and your family cool, and saves you a great deal of money on heating and cooling! If your utility bill has been increasing and your HVAC unit is working at full capacity, then chances are your attic insulation has degraded. Over a period of time, the cellulose or fiberglass that forms your insulation “settles” and stops serving its purpose. In order to keep your home at the temperature that you are used to, your air conditioning system will have to work overtime. This means that your air conditioning will require more electricity to generate the same amount of energy, putting a major dent in your wallet. Even if you aren’t experiencing significant problems with your attic insulation, it’s still best to replace your attic insulation sooner rather then later. Unnecessary wear and tear on your air conditioning unit WILL result in you having to make expensive emergency repairs. Besides, your attic insulation will pay for itself before you have to worry about the hassle of repairing or replacing your air conditioning system! We at Home Comfort USA consider our customers to be family, so we wan’t you to stay cool and comfortable with the most bang for your buck. When you are ready for us to drop by, just fill out this contact form and we’ll assist you at your convenience! Congratulations on your new air conditioner from Home Comfort USA! We’re glad that you found the perfect HVAC unit for you and your home, but this is just the start of getting your air conditioner working at full capacity. In order to ensure that you are getting the most out of your air conditioning system, you can count on the experts at Home Comfort USA to install it correctly. When it comes to air conditioning systems, bigger is not always better. The square footage of your home, the climate in which you live, and the type of insulation in your home all factor into what air conditioner will be most cost-effective to you. Since there are so many variables to consider, each installation job will be unique. Our professionally trained staff survey the size and design of your duct work, calibrate your unit’s settings accordingly, and make any adjustments necessary so that your air conditioning system is running at full capacity. When replacement air conditioners are installed incorrectly, you’ll experience a host of problems including inconsistent temperatures, an increase in humidity, and even dangerous carbon monoxide leaks within the home. And don’t forget about the extra money you’ll be spending on your heating and cooling bill! Properly installed air conditioning systems put less strain on the air conditioner, thereby increasing its shelf-life and preventing you from having to make expensive emergency repairs. We don’t want you to worry about ever having to replace your air conditioner again, and we certainly don’t want you to spend a day without an air conditioner! The air conditioning systems of today are much more advanced than they used to be. Likewise, the process of installing these innovative new systems is more advanced. Many air conditioning contractors will not give you the best air conditioning system simply because they don’t know how to install it. Home Comfort USA continues to retrain our technicians so that we can provide you with the best product possible. Call Home Comfort USA for a free estimate on the best air conditioning systems provided with the best service. If you live under the hot Southern California sun then you definitely don’t want to depend on a faulty air conditioning system! Most people still have the original air conditioning system in their home, which simply will not operate with the same efficiency as the day your home was built. Even if you’ve already replaced the air conditioning in your home, you may have noticed that your energy bill has already gone up and that you aren’t even as comfortable as you used to be. Home Comfort USA guarantees that routine maintenance of your air conditioning system will save you money, make sure that you stay comfortable, and prevent you from having to make costly emergency repairs. In all of our years of experience in the air conditioning industry, we have encountered every type of problem that could occur with every make and model of air conditioner. To streamline the process of making a diagnosis and making a quick repair, we have developed a 32 point ac tune-up and cleaning procedure. We leave no stone unturned when we inspect your air conditioner… you won’t be left with any leaks or faulty parts, electrical problems, or pressure issues. We’ll get your air conditioner running just as effectively as the day it came out of the factory! Routine maintenance doesn’t only save you money on your monthly utility bill. By making sure that your air conditioner is running at maximum productivity you’ll put less stress on the unit as a whole, thereby extending your air conditioners shelf-life. This strongly reduces the chance that you’ll have to go through the hassle of replacing your entire air conditioning system. Before you even start having problems with your heating and cooling, let Home Comfort USA make a quick house call to prevent any break-downs and to make sure that you are getting the most out of your air conditioner. Contact us today and we’ll have on our experienced technicians out at your earliest convenience! 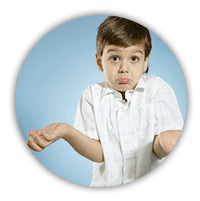 A broken air conditioning system is a stressful situation and can lead to a lot of questions… Why did it break? Will I have to make repairs or make a full replacement? How long will I be left without air conditioning? Don’t panic! Home Comfort USA is here to answer all of these questions and solve every problem. With our knowledge, expertise, and customer service Home Comfort USA has earned its reputation as Southern California’s favorite HVAC service. We work 24 hours a day, 7 days a week to make sure that your home is always cool and comfortable. We’re just a short phone call away from arriving at your door with a fully equipped service truck. Normally, we’ll be in and out of your house in less than an hour! To make sure that there is no problem that we can’t solve, Home Comfort USA continues to retrain our technicians on the latest technology. We can make a quick diagnosis and restore any air conditioning system back to its factory specifications. We want you to have full confidence in the work that we do, so we make the extra effort to help you understand exactly what is going on with your air conditioner and what we have to do to fix it. Nobody plans on having a broken air conditioner, so they rarely break at a convenient time for you. We don’t want your air conditioner getting in the way of your plans, so just let us know the best time for you and we’ll be there right on time, if not a few minutes earlier. If your air conditioning is exhibiting any of these symptoms, or if the air conditioner has stopped working altogether, call Home Comfort USA to experience Southern California’s best air conditioning service! If your home is over 10 years old and is still using its original HVAC system, chances are that you’re already experiencing difficulties with your air conditioning system. Faulty heating and cooling systems can result in inconsistent temperatures, loud noises, and lower air quality inside of your home. These problems aren’t just annoying, they indicate that your air conditioning is not functioning properly. Even worse, your utility bill will skyrocket and you will have to pay for emergency repairs. Today’s air conditioning systems are far more advanced than they were ten years ago. They provide many more options to make sure that you are getting the most out of your investment. HVAC systems are not one-size-fits-all… To find the best HVAC system for you and your home trust Home Comfort USA to bring you the best HVAC system… with the best service… at the lowest cost. Most homes are equipped with a central air conditioning system. A central air conditioning system operates by forcing air to every room of the house. Unless there is somebody in every room of the house, you’ll be wasting your home’s energy conditioning empty rooms. Home Comfort USA offers an innovative new service called HVAC Zoning to help you avoid wasting the energy produced by your HVAC system. HVAC zoning allows you complete control over how hot or cold you’d prefer each room, so you won’t be spending a penny more than you have to. Zoned Systems utilize mechanical dampers within your home’s ductwork to open and close different “zones” to divert energy to where you need it. Each zone is controlled by a separate thermostat so that your family can control how hot or cool they’d like each room. Your family will be more comfortable AND you’ll be spending less on your utility bill! A heat pump is a single appliance that controls both your home’s heating and cooling. Using two separates appliance for heating and one appliance for cooling will cost you more money for installation and maintenance fees. Heat pumps are also more energy-efficient and will reduce your monthly utility payments. It doesn’t matter if your home has a central air conditioning system or a ductless mini-split system. Home Comfort USA can install a heat pump system into any home so that you can enjoy the full benefits that a heat pump has to offer. Mini-split HVAC systems use a single outdoor component that connects to several indoor air handlers. This allows you to divert cooled air to specific rooms instead of wasting your home’s valuable energy to cool the entire house. If you use window air conditioners or if your house has no existing ductwork, you’ll be amazed by the difference that a mini-split HVAC system can make. The simple mechanics of a mini-split HVAC system is what makes them so efficient. There are two basic elements to a mini-split HVAC system: an outdoor condenser or heat pump and a series of indoor air handlers. When your air conditioning is in use, the outdoor unit sends a refrigerant solution through a cable to your selection of specific indoor air handlers. The cables used today can have a linear distance of up to 230 feet and can be up to 160 feet high. This is enough length to easily accommodate most residences. Home Comfort USA requires only a small access point to install these cables, which is much cheaper and much easier than installing an entire ductwork system throughout your home. The latest in mini-split HVAC systems are capable of using only a single outdoor unit to connect to several indoor air handlers. The various air handlers throughout your house are controlled by either a touch panel or a remote. This gives you complete control over how hot or cold you’d prefer each room to be. With a mini-split HVAC system you can enjoy the most comfort with the highest possible energy-efficiency. Home Comfort USA will allow you to choose where you would like to place the air handlers throughout your house. They can be mounted on ceilings, walls, and even floors. You’ve worked hard decorating your house to make it your own, so we will go the extra mile so that our air handlers are discrete and will not affect the look of the room. Mini-split HVAC systems do not rely on ductwork to divert air throughout your house. This will save you money each month since the hot or cold air generated by the outdoor unit will not be lost traveling through the ductwork. You will also save money long-term since you will not have to maintain or repair the ductwork used in a traditional HVAC system. If you think that your air conditioning system is not energy-efficient and does not provide the comfort that you deserve, call Home Comfort USA. We will provide a free consultation to discuss what a mini-split HVAC system can do for you! When the sun shines on your roof the heat transfers from the roof to the attic and eventually into your living space. In order to compensate for this extra heat you’ll have to run the air conditioning at a lower temperature for a longer period of time to keep your home cool. Not only is this going to cost you extra money on your utility bills… the wear and tear that your air conditioner endures will eventually cause it to break down. Properly installed Radiant Barrier Technology will stop the transfer of heat from the attic to your home, make your home energy-efficient, and extend the life of your air conditioning system. Hot air naturally flows towards cold air. There’s not much we can do about the heat coming from the sun, but we can stop the heat at your attic before it reaches the rest of your house. Radiant barriers are installed in your attic perpendicular to the sunlight, which will reflect the heat back to its source. 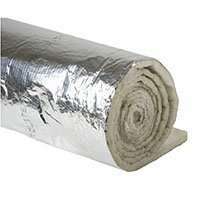 Radiant barriers can come as either a reflective insulation foil or as a reflective spray. No matter what kind of radiant barrier is best for your home, you will still be reflecting 75-80% of solar radiation. Using radiant barriers in your home is one of the quickest and easiest way to reduce heat entering your home and to save on your utility bills. Home Comfort USA has the experience and know-how to properly install radiant barrier technology to any home. All that we have to do is get access to the underside of your roof from your attic. From there, we work diligently to thoroughly coat every inch of the attic that’s exposed to the sun. We guarantee that there will be no place for unnecessary heat to seep through your roof. Once your radiant barriers are installed, you’ll never have to pay to maintain or repair it! You won’t even have to make any adjustments to the way you run your air conditioner. Radiant barrier technologies are guaranteed to pay for themselves with the money you save on heating and cooling, and they will continue to function just as well as the day that they were installed. If you’re thinking about how you can improve your homes energy-efficiency and cut back on your utility bills, you’re probably wondering about your air conditioning system. Heating and cooling account for roughly half of the energy bill in the average household, so your air conditioning system is a great place to start upgrading. 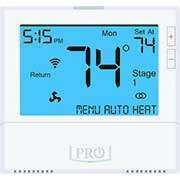 The easiest way to start these upgrades is with one of Home Comfort USA’s programmable thermostats. Programmable thermostats allow you to schedule what time your home’s heating or cooling comes on, and at what temperature. If you do not have a programmable thermostat, you will be losing efficiency no matter how advanced your air conditioning system is. A programmable thermostat offers you efficiency, comfort, and control… all at the touch of a button. Once your programmable thermostat has been set to your liking, your air conditioning will run itself. With a standard thermostat, you have to manually adjust the system’s temperature throughout the day. When you schedule your air conditioning system with a programmable thermostat, you are guaranteed total comfort regardless of the weather outside. Programmable thermostats ensure that you will not forget to turn your system off and on, thereby saving you money and energy. Even more importantly, at the end of a long day, you’ll be able to step into the comfort of your home without having to wait for the air conditioning system to reach the perfect temperature. The U.S. Department of Energy finds that by utilizing a programmable thermostat, you’ll be able to save 15% on your annual energy bills. By minimizing how much you use your heating and cooling you will reduce fuel consumption, which will not only save you money but also making your household eco-friendly. Running your air conditioning less also reduces wear and tear on your HVAC system. This will save you the stress of having to make expensive repairs, not to mention the inconvenience of not having air conditioning. Thanks to wi-fi technology, the latest programmable thermostats are capable of “learning”. Just like with a regular programmable thermostat, you would set the schedule for heating and cooling in your home. From there, a learning thermostat will make adjustments to your air conditioning system by detecting what times it detects the wi-fi from your phone. Learning thermostats offer total convenience, minimal fuel consumption, and reduced energy bills. Enter your Zip code to see if we service your area. © 2019 Home Comfort USA. All rights reserved.